What Is Pycnogenol, and What’s It Used For? Tree bark ordinarily is not the first thing we think about when looking for plants and plant extracts best known for providing health benefits, but Pycnogenol® (PYC) is a different story. There’s plenty of health-inducing bite to this bark. Just like keeping the oil changed in your car to keep engine parts properly lubed or taking the right steps at home to make sure your drains don’t get clogged, it’s important to live a healthy life aimed at keeping your arteries cleaned. That latter point is a life-and-death proposition, not to be trifled with. Alpha Lipoic Acid: What Is It and What Does It Do? Alpha lipoic acid is also known as lipoic acid and thioctic acid, but whatever you choose to call it, it remains a compound found in almost every cell in your body – providing protection to those cells. Its primary role is to support your body’s normal functions by converting glucose – aka blood sugar – into the energy needed to drive those bodily functions. Chief executive officers have it made. They command the highest pay in their company or organization – for them it’s called a ‘compensation package’ – and they bask in their power, prestige and jet-setting lifestyle, right? If you are one of the many who confuse the terms folate and folic acid, you are forgiven. That’s because you haven’t done anything wrong. Essentially, they are one and the same – sort of. Folate, otherwise known as vitamin B9, is one of many essential vitamins, and it is naturally occurring, found in many types of foods. Folic acid is the synthetic version of folate/B9, used to fortify foods and also a key ingredient in nutritional supplements. Berberine is one of the most versatile nutritional supplements known to man, recognized for its wide range of health benefits that include treating metabolic syndrome, type 2 diabetes, high cholesterol, and inflammation, among other conditions. Being a firefighter is about more than sliding down a pole, holding onto a firetruck while racing to the scene of a fire, manning a high-pressure hose, rapidly climbing ladders, running up flights of stairs, breaking down doors and other obstacles with an axe, and dodging incredibly hot flames while rescuing trapped people. A lot more, which helps explain that living the life of a firefighter 24/7 is a risk-filled challenge not for the faint of heart. CoEnzyme Q10: Secret Supplement for Bypass Surgery Recovery? “CoQ10” may sound like a droid in Star Wars, but it’s actually a naturally occurring substance in the human body. Also known as “CoEnzyme Q10,” this substance plays a critical role in several body functions, including heart health. Unfortunately, research suggests that some people may have reduced levels of this substance, reports the National Center for Complementary and Integrative Health. This substance decreases as you age, and it is believed that many diseases, including some genetic disorders, are associated with low levels of CoQ10. To anyone who has a sweet tooth and has longed for a ‘miracle’ food that is not only sweet and tasty but also healthful and beneficial (and low on calories) need dream no longer. There is such a consumable – cinnamon – that in fact has been around for thousands of years and which provides a plethora of potential health benefits that sound almost too good to be true. But it is true. The first thing you need to know about fish oil is that it is one of the most frequently consumed dietary supplements, and it contains an abundance of omega-3 fatty acids, which can boost your health in many ways. All you must do is give fish oil a chance, whether it be eating some of the many types of fish that contain fish oil (such as lake trout, sardines, salmon, oysters, various types of tuna, swordfish, anchovies, and herring, among others) or adding it as a daily supplement to your diet. Then watch it go to work inside your body. If you follow a healthy, well-rounded diet that includes meat, fish, yogurt and raw milk, you probably don’t have much to worry about when it comes to having sufficient vitamin B12 in your system. Without a steady supply of B12, though, you could be dealing with debilitating symptoms such as chronic fatigue, muscle aches, joint pain, shortness of breath, mood changes, poor memory, and even poor dental health. Most of the various vitamins, minerals, and elements that you need to survive and thrive are naturally manufactured by your body. Then there are some substances vital to your well-being that you need to provide for yourself, either through your diet or supplements. One of those is iodine, an essential trace element. You don’t need a lot but what your body does need is vital, especially in regard to your thyroid gland. About one in 10 Americans have diabetes, which works out to more than 30 million people. More than 80 million other U.S. adults are at the risk of developing type 2 diabetes, and that’s sobering news when you realize that this disease – which is closely aligned with blood glucose levels in your body – can lead to blindness, nerve damage, and kidney disease, among other health issues. Health, nutrition, and supplementation together cover a myriad of topics, and there are times that such discussions have the look and feel of a science fiction novel. Such as when the subject turns to gene mutation, in this case MTHFR mutation, a gene variation that can affect how successful your body is in metabolizing folate and folic acid, both of which are forms of vitamin B9 that play key roles in many key bodily functions. Tea for Two, but Are Alleged Health Benefits True? Let’s cut to the chase by answering the question posed in the title of this article. Yes, the alleged health benefits are true, or at least appear to be true, but such a declaration comes with several caveats. One qualifier is that not all teas sold on the market are real teas – those being ones derived from the Camellia sinensis plant. Plus, actual testing of tea’s beneficial potencies has been limited to animals and not humans, so we can’t quite say ‘yeah’ with 100 percent confidence. With Halloween just a couple weeks away, what better way to conclude this three-part series on nutritional seed supplements by carving out some time to talk about pumpkin seeds? One good thing to know about pumpkin seeds right off the bat is that they are alkaline-forming, per care2.com, which means consumption of them can go a long way toward balancing out your body’s pH levels in a world full of acidic foods. Think, for example, gooey or hard candy that will make its ways into millions of kids’ trick-or-treating bags. In this second of three blogs in our impromptu good-things-come-in-small-packages series of nutritional seeds, we turn our gaze to flaxseeds, which have been around for a long time – as in 6,ooo years long! These small seeds – which can be found in brown, tan, or gold-colored varieties, are a rich source of omega-3 fatty acids known as alpha-linolenic acids (ALA) and can fight the good fight for good health on several fronts, such as blood sugar, heart disease, digestion, skin complexion, cholesterol, and hormones. When planting a garden, such as the one in your backyard, it is imperative that you have the right seeds in hand to make it possible to plant, nurture, and harvest a nice assortment of vegetables for the family dinner table. Ditto for your body and an assortment of nutritional seeds. As small as they are, such seeds can be indispensable for your health; it’s just a matter of knowing which ones can do what, and then being sure to include them as part of your daily dietary regimen. Your blood sugar level is a funny thing, and we don’t mean in a laughing sort of way. If it’s off just a tad from the norm, whether a mite high or a bit low, it’s not exactly a win-win situation. More like a lose-lose. Each deviation of blood sugar level from what’s optimum, up or down, comes with its own set of issues regarding body function. Ask a half-dozen people their favorite health attribute linked to milk thistle, and you will likely hear six different answers. That points to the versatility of this flowering plant (reddish-purplish flowers) found mostly in Mediterranean countries and which belongs to the same plant family as the daisy. Scientifically known as silybmum marianum, milk thistle actually goes by an assortment of names that also include Mary thistle, holy thistle, and Scotch thistle. Consider this the nutritional supplement version of combining two favorites – peanut butter and chocolate – into one, and producing a whole that apparently is better than the sum of its parts. While this isn’t about Reese’s peanut butter cups, it is about the beneficial effects you can get from supplementing with vitamin B12 and omega-3 fish oils at the same time. September is Healthy Aging Month, and even though the month is drawing to a close, there’s never a bad time to be thinking about healthy aging and what you’re going to do about it in the coming years. That’s regardless how old you are right now. They say it’s never too late to start a new hobby or learn a new skill; flip that philosophy, and you can say it’s never too early in life to be thinking about and preparing for your future health, especially once the gray hairs start popping up. There are myriad weight-loss products on the market – there has been for decades – and choosing the right one(s) can be an exasperating chore. Fretting over such a choice would be OK if it meant losing a few pounds in the process, but that’s not going to happen. So let’s help you cut through the smoke and offer a suggestion worth a look – L-carnitine. You’ve probably been asked at least once that if you were to end up on a deserted island and could only take one thing with you (short of a boat or helicopter), what would it be? Well, let’s take a variation of that question – one that is much less daunting – and it goes like this: If you could pick only one nutritional supplement to take with you to that deserted island, and assuming an endless supply, what would it be, and why? We can think of several, but one great choice would be berberine. Even if you’ve never wanted to be in a heavy metal band, let alone ever entertained the thought or bothered listening to the stuff, chances are that you have some heavy metal inside of you, whether you like it or not. Small amounts of heavy-metal toxins are pervasive in our society, and we ingest or breathe in some of it quite often, presumably without our ever knowing it, at least not most of the time. Potassium is the third-most plentiful mineral in your body, and that’s a really good thing because it’s a mineral that provides numerous healthy benefits for your body. Not only is potassium an electrolyte, one of about a half-dozen that are essential to our well-being, it also serves a multitude of core function that include regulating your body’s balance of fluids while also controlling the heart’s electrical activity, preserving bone mineral intensity, and decreasing the unwanted formation of kidney stones. Flavonoids: What Are They - Where Are They From - What Do They Do? For years we have been reminded by well-meaning folks to be sure to eat our fruits and veggies, and there is a good health-related, scientific reason for this. Fruits and vegetables are the most abundant food source of flavonoids, which are responsible for the vivid colors of fruits and vegetables and, even more importantly, are characterized by their antioxidant, anti-inflammatory, and immune system-bolstering properties. We all know what it feels like to get an electrical shock, like when we experience a buildup of static electricity and then touch something made of metal (shocking us in more ways than one). Not a pleasant experience, although electrical charges are not alien to our normal function as human beings. Many of your body’s processes depend on a small electric current to operate, and substances known as electrolytes provide this charge while interacting with each other as well as cells in our tissues, nerves, and muscles. Elite athletes, especially those competing in endurance sports such as biking, swimming, and running, seem to like cordyceps mushrooms for the powers they can bestow upon them in terms of improving respiratory health, increasing oxygen uptake, and boosting energy. There’s a lot to like there when your task is to cover a whole lot of yards or miles and your goal is to get to the finish line before anyone else does. Suppose you are about to be stranded on a small island out in the middle of the Pacific Ocean – even if it’s totally inconceivable you’d actually get advance notice for that sort of thing – and you can take only one nutritional supplement with you. What would it be? Well, depending on your personal preferences and particular state of health, there are, arguably, several right answers. But the best answer? Let’s start (and end) with turmeric. For anyone who is overweight, afflicted with high blood pressure and looking to build muscle mass while also alleviating their symptoms of asthma, the herbal supplement forskolin might be just what the doctor ordered. Or at least it’s worth a discussion with your physician or other health-care professional, mindful of forskolin’s purported wide range of health benefits. Not everyone is a fan of fatty fish or any other kind of seafood, for that matter, but we all can benefit, especially heart health-wise, by sticking to a diet that includes ample omega-3s. The question then becomes: how can we get a good supply of omega-3s without eating fatty fish such as salmon, tuna, mackerel, or sardines? Life isn’t always a bowl of cherries, as most of us well know, but a bowl of cherries is, well, a bowl of cherries. They enhance our health, no question. Cherries are a fruit that can provide us many health benefits, thanks to a potent makeup that includes plenty of fiber, antioxidants, and anti-inflammatory compounds, making the small, red fruits one of the healthiest foods around, even when topping a thick, delicious calories-laden milkshake. Ashwagandha, also known as Indian ginseng and winter cherry, is a powerful herb that has been used for a very long time for various medicinal purposes. That’s “a very long time” on the order of 3-5,000 years, with ashwagandha a popular compound among practitioners of ancient Ayurvedic medicine – a practice of natural health with roots in India – cognizant of the herb’s rejuvenating and restorative benefits. It’s not by the skin of your teeth that resveratrol possesses the power to provide a variety of health benefits. It’s more like the skin of your grapes. Red grapes, that is. For it is from the skin of grapes, among other sources, that resveratrol is produced – a polyphenol that is believed to act like an antioxidant, protecting our body from the kind of damage that can make us susceptible to serious problems, such as heart disease. Many of us grew up being force-fed, or to put it kindly, spoon-fed, when Mom was trying to heal us from a cold or fever or upset stomach or indeterminate pain somewhere that needed her attention in order for the whimpering to stop. In those days, the worst a remedy tasted, the more effective it was in treating the illness or infirmity. That didn’t make it any easier going down the hatch. Then came ginger. In one of our recent blogs, we reviewed the many health benefits that an apple a day – or even just a few a week, depending on your tastes – can provide us. In so doing, we learned about quercetin, found in the skin of an apple. Quercetin is what’s known as a flavonoid, a plant pigment that has been determined to be a powerful antioxidant and often the key component in the red and orange pigmentation found in various fruits and vegetables. Subsisting on a diet of nothing but berries might seem a realllll stretch, and it is, as it’s doubtful that any nutritionist or other health expert would ever recommend it. But a closer look at the variety of berries and their benefits afforded us – not to mention what all the other fruits and vegetables of the world can do for us – tells us that there is a lot of good to come from a steady consumption of berries, even if just as a supplement to our main courses. Mushrooms are fascinating plants, not just because of the myriad health benefits they provide as a “superfood” of sorts, but for the “starring” roles they have played in children’s literature (i.e., “Alice in Wonderland”) and in the expanded minds of hipsters from the psychedelic ‘60s and ‘70s drawn to “magic mushrooms” and their hallucinogenic properties from a substance known as psilocybin. Vitamin B6, with pyridoxine as its main ingredient, is a water-soluble vitamin known to be helpful in treating an assortment of health-related problems. These range from issues of the heart to those of the skin as well as those related to depression and the nervous system. Even then, that doesn’t account for all the good that B6 can do for us, or for that matter all the complications we could face if we don’t have enough of it in our bodies. What Is Vitamin B5 (Pantothenic Acid) and What's It Good For? Sometimes the best way to describe a vitamin or other supplement is by explaining what happens when you don’t have enough of it in your body. All vitamins and supplements tout a variety of benefits, but what sets vitamin B5 apart from most other vitamins is how a B5 deficiency can produce a relatively uncommon and positively irritating symptom known as “burning foot” syndrome. As athletes – which many of us are in one respect or another, knock on wood – we learned in the early going the importance of staying hydrated, i.e. drinking plenty of water, which is especially important when performing activities that leave us soaked in sweat. Then came the realization that hydrating with just water might not be enough. Now, we’ve been told – and perhaps reluctantly we concur, we also need to stay replenished with electrolytes. Should I Drink More Green Tea or Matcha? As Kermit the Frog is so fond of saying, It’s not easy being green. But Kermie probably has never sipped from a nice, piping-hot cup of green tea. It not only tastes great and is less filling but also full of healthy properties that make it a great benefit to our health in numerous ways. Some experts – human ones, in fact – have gone as far as to describe green tea as the healthiest thing to drink, period. It has often been said that “What you don’t know won’t hurt you,” but we found it smarter, safer, and healthier to take the approach that “What you do know can help you.” That’s the case with polyphenols, about which we have been learning much more in the last decade or two, and that is polyphenols can help us, healthwise for sure, and in a variety of ways. The choices people make in life often help define them. Paper or plastic? Winter Olympics or Summer Olympics? For guys, Ginger or Mary Ann? Then there’s coffee or tea? Regarding the latter, a handful of drinkers swear by both, but in most cases it’s one or the other, and, in terms of health, neither really is a bad choice (unless you abuse them). Most coffees have more caffeine than most teas do, but teas do a bang-up job when it comes to providing health benefits. Regardless what kind of physical workout you are planning to do tonight, tomorrow, or next Tuesday, chances are you could use a little boost to help get you going – or to keep your motor running at optimal performance. Eating a healthy diet and getting plenty of rest at night are key to great workouts, but oftentimes you need more, and this is where nutritional supplements can help full in the dietary gaps. We all have them, even if we think we don’t. This how it usually goes with probiotics – make mention of these living microorganisms and the conversation goes straight to how probiotics benefit digestive and gut health. You know the drill: probiotics consist of “good bacteria” that are consumed via fermented foods or supplements and act to restore or strengthen the natural balance of gut bacteria. This aids in proper digestion and helps ward off diseases (such as inflammatory bowel disease and ulcerative colitis) and even diarrhea, which can often be a side effect of antibiotic use. You snooze, you lose, right? Actually, yes, and in a good way. At least it’s a good thing if you are trying to lose weight, or at least shed some of that beer belly. Research has shown that getting sufficient sleep – usually targeted at eight hours, give or take an hour – is a key factor in maintaining or even improving our health, which includes keeping off or shedding the pounds in many cases. If you’re looking for a nutritional supplement that is the Baskin Robbins of the health food industry – you know, 98 flavors and all that stuff – you might consider turmeric, with its key ingredient curcumin. Turmeric/curcumin might just be the Jack or Jill of all trades among supplements because of the many ways it can contribute to our good health, from top to bottom and from side to side with our bodies. One of the most fascinating things about nutrition and health is the number of times that something old – something really old, even – is found to have new human health applications, or at least relatively new when it comes to medical and nutritional science in America. Case in point: berberine, a plant-based compound that has been used in traditional Chinese and Ayurvedic medical practice dating back more than 1,000 years. Looking out for and taking care of our health can be a complex chore with a multitude of factors, body parts, and organs to think about. However, it’s not too difficult to know where a good starting point is when it comes to health considerations – the heart. For the average person, the heart beats more than 85,000 times a day, pushing out blood through miles and miles of arteries, veins, and capillaries, supplying our body with what it needs to survive and, presumably, thrive. Berberine: A Supplement for Diabetes as Good as a Drug? The Centers for Disease Control and Prevention (CDC) has declared diabetes an American epidemic, with more than 25 million Americans afflicted with diabetes. Another 80 million are classified prediabetic, per the American Diabetes Association. The numbers get even bigger when you put a dollar sign in front of them: As of 2012, $245 billion a year was being spent on diabetes in the U.S., including $176 billion in direct medical costs and the rest -- $69 billion – in lost productivity. Keeping our heart strong and healthy should be an everyday goal that never goes away or gets covered up. It is predicated on how well we conduct our lives, how we eat, how we exercise, how devoted we are to submitting to a physical checkup with our physician every year to make sure all things cardiovascular are ticking and operating correctly. Having a good working knowledge of supplements can help in a big way, too. Omega-3 fatty acids, usually found in fish oils, comprise one of the best go-to nutritional supplements when it comes to restoring, maintaining, or even improving our health. Name any well-known health condition that can be aided by particular types of diets, then put together a list of foods and supplements deemed highly suitable for such diets, and, finally, be amazed by how often omega-3’s appear on those lists. More than 600,000 Americans die from heart disease every year, making it the No. 1 cause of death in the United States. That works out to one in four deaths each year being related to heart disease, with cholesterol often a key factor. The most common type of heart disease, according to the Centers for Disease Control and Prevention (CDC) is coronary artery disease, which can lead to heart attack. It’s an old story but one that bears repeating if you want to grow old: high blood pressure, or hypertension, has been called the “silent killer” because its symptoms are rarely noticeable. However, that is not to say that hypertension is a death sentence. A variety of medications effective in lowering blood pressure (BP) are available. Better yet, there are natural alternatives that have proved useful in reducing BP to healthier levels. More than 100 million Americans, or nearly one in three, have high cholesterol. Cholesterol readings higher than 200 mg/dL are generally considered excessive, bringing with it an increased chance of clogged arteries that can lead to heart attacks and strokes. Numerous prescription medicines are on the market – and there likely are more coming through the pharmaceutical pipeline – aimed at lowering cholesterol. When it comes to reaping the benefits afforded us by the omega-3 fatty acids found in fish, salmon earns a well-deserved spot on the conversation. One way of taking advantage of salmon’s omega-3 fatty acids is by buying, grilling and eating salmon; a healthy alternative is salmon oil that is offered in the form of a popular nutritional supplement. A main course of mushrooms will never be found on many, if any, menus, but as a garnishment with assorted healthful benefits, mushrooms have few peers. Labeled as a “superfood” by nutrition experts, mushrooms are low in carbohydrates and calories and full of B vitamins, trace minerals, fiber and protein that make them a powerful anti-inflammatory food that also bolsters our immune system, among other health-inducing qualities. The most health conscious among us have known for decades that consumption of omega-3 fatty acids is good for our health. Only in recent years, though, have experts begun to learn the full extension of the reasons why. At the center of this revelation is the newly identified fatty acid docosapentaenoic acid (DPA), which has been found in elevated levels in the diet of Greenland Intuits, whose incidence of cardiovascular disease (CVD) is remarkably low, per naturalproductsinsider.com. The fact that the herb ginger can provide a variety of health benefits surely puts a smile on most people’s faces. In addition to being healthy for us in so many ways, ginger also is a tasty favorite when added to food and beverages. In terms of our health, ginger for centuries has earned a sterling reputation for its ability to relieve digestive problems such as nausea, loss of appetite, motion sickness and stomach ache. And that’s just for starters. We humans and our bodies have a nifty reciprocal arrangement. We, of course, need our bodies to do the things we want and need to do in our lives, such as getting around, performing our jobs and skipping rope, just for starters. In turn our bodies need for us to take care of them by feeding them with nutrients that they are unable to produce for themselves. Those nutrients include the inorganic substances found in foods, known as minerals. For anyone who has ever been unfortunate enough to suffer from heavy-metal poisoning—not to be confused with loud rock music, chelation therapy is an effective antidote. For anyone who has ever been unfortunate enough to suffer from heavy-metal poisoning—not to be confused with loud rock music, chelation therapy is an effective antidote. Chelation therapy involves the use of EDTA (ethylenediaminetetraacetic acid), a synthetic amino acid, which is injected into the bloodstream. Once there, and as it passes through the body, it binds to metals such as lead, mercury, copper, iron and arsenic, and then removes them through the bodily elimination of urine. Chelation therapy involves the use of EDTA (ethylenediaminetetraacetic acid), a synthetic amino acid, which is injected into the bloodstream. Once there, and as it passes through the body, it binds to metals such as lead, mercury, copper, iron and arsenic, and then removes them through the bodily elimination of urine. It is a common health question people ask themselves, and that includes those who haven’t yet been diagnosed with a related problem: How can I control, or even lower, my cholesterol naturally? In fact, How exactly do I lower cholesterol without using prescription medicine? and How quickly can I lower those cholesterol levels? High blood pressure. It is one of the most commonly mentioned health issues in America, and for good reason: nearly a third of all Americans have high blood pressure and, according to healthline.com, another third have what's known as prehypertension. That's where blood pressure (BP) is higher than what's considered normal (a reading most often cited as 120/80) yet not quite high enough to be categorized as hypertension. Keeping a healthy heart can require exercising, eating more fruits and vegetables, or sticking to a high-fiber diet. According to researchers, supplements also may help encourage heart health. It’s important to understand what they are and how they might contribute along with diet and exercise. Here are five supplements and vitamins that could help. As you know, the simple things you do every single day can lead to a lifetime of benefits, especially when it comes to your health. Specifically your heart health. With heart disease being the No. 1 killer of American adults, it’s worth making every effort to adopt a few daily habits to boost your heart health. It’s a matter of improving the way you eat, walk and breath. The basic stuff. Take a look at these 6 habits that can get you on the road to better living. It’s been more than 40 years since the first anti-smoking campaigns got underway, with studies clearly showing that the habit can lead to diseases like lung cancer. Along the way, research also showed the connection between smoking and heart disease. In recent years, a new campaign has gotten underway to promote another bad habit that could lead to premature death. Unfortunately, it’s a habit that’s shared by millions of Americans — sitting. Whether you’re sitting behind a desk, in front of the television, or anywhere else, the simple act of sitting for hours on end could be shaving years off your life, according to research. Numerous media outlets, including CNN, have been reporting on the deadly effects of sitting. According to a study published by the American Heart Association, people who don’t move enough and sit for five hours or more each day have double the risk of heart failure. And other studies show that the vast majority of Americans are sitting anywhere from 7 hours to 15 hours a day. Take the test by JustStand.org to see how you measure up. Are you sitting way too much? Then it’s time for a change. So, how do you get moving for better heart health? Try to break up your days of sitting by following these ten tips. In most cases, you already know what it takes to live a heart-healthy lifestyle. Chances are you’ll immediately think of exercising, eating more veggies and less processed foods, giving up smoking, and managing your stress as key things you can do to ensure you’re doing great things for your body. But, as most Americans can attest, it can be difficult to stick to those healthy habits day after day — especially when you have a demanding work and home schedule, and you’re constantly bombarded by unhealthy foods in grocery aisles, restaurants, and well-meaning friends and relatives. Indeed, you have your work cut out for you. But it’s so worth it. Here are a few tips to get you adopting healthy habits that actually stick. The main goal is to take it one day at a time. According to a study published by the British Journal of General Practice, it takes about 66 days for you to turn a certain behavior into a habit. Now try these 4 additional tips for better heart health. Maybe your New Year’s resolutions have been long forgotten. If you already dropped the diet and haven’t spent much time in a workout facility, don’t despair. Maybe you were overthinking it. Here are 2 bad habits to drop, and 3 really good ones to pick up to get on the path to a lifestyle that keeps your heart healthy. If you only tackle one at a time — whether it’s dropping a bad habit or picking up a new one, you’ll be one step closer to guarding yourself against heart disease — the No. 1 killer of American adults. When we talk about discovering the fountain of youth, too many of us immediately think of the potions that will reduce the appearance of wrinkles and other outward signs of aging. How about guarding yourself against the No. 1 killer of American adults — heart disease? Fortunately, there is no discovery necessary to find the keys to a healthy heart. Study after study has revealed that we can do a lot to reduce the risks of heart disease by eating a healthy diet, keeping stress under control, and exercising regularly — taking great care of our bodies. While these areas are essential in boosting heart health, research also shows that supplements can be beneficial in helping lower cholesterol and maintain a healthy blood pressure — areas that are related to preventing heart attacks and strokes. Take a look at these 4 supplements that can boost heart health. If you were told that there was a secret to a longer life, there’s no question that you’d want to hear about it. Well, as it turns out, the secret is not so secret. Taking steps to boost your heart health is one of the keys to longevity. Reduce your risk of this No. 1 cause of death among American adults, and you’re off to a good start. One of the most significant steps you can take is changing up your daily diet. Diet, along with exercise, tackles many of the issues that can cause heart disease and stroke, including high blood pressure and high cholesterol. Reducing your risk for heart disease — the No. 1 cause of death among both American men and women — doesn’t have to be a massive undertaking. By making changes in your daily routine, you can start eliminating the factors that lead to heart disease. While some changes may be more challenging than others, they all can be significant in contributing to your overall heart health — and your longevity. Make a commitment to adopting these habits as part of your daily routine. The foods you eat and the bad habits you avoid make a significant impact on your heart health. But are you doing enough to ensure the healthy beat goes on and on? Heart disease is the number one cause of death in the United States - but a majority of heart conditions can be avoided with the right lifestyle and mind set. Since 1962 Wonder Labs has been helping people live healthier lives by offering natural nutritional products. 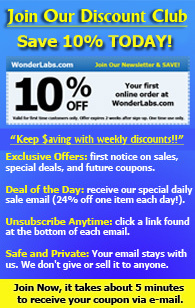 Today, Wonder Labs is one of America's top leaders in the nutritional field.